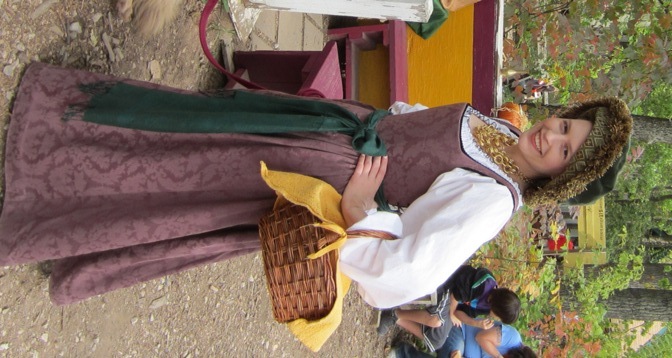 This project started with a vow and a tablecloth: I would finally make a boned kirtle in 2011–or give up costuming! Happily, I did not have to give up costuming. Whew. Although it was a near thing; for some ridiculous reason, this project took me nearly 9 months to complete. A kirtle is a basic, sleeveless dress that forms the foundation layer for many period gowns. The kirtle can be worn by itself for casual or work wear, or with any number of additional pieces (gowns, doublets, sleeves, coats, etc) over top of it. The base of the kirtle is the Simplicity corset pattern (2621), adapted for side-back lacing, with a simple gored skirt attached. (Now why, I ask you, should that take anyone nine months?! It isn’t like it had to develop brain cells and limbs, after all.) Ahem. The fabric is two cotton-blend damask tablecloths from J.C. Penney. It turned out to be a very user-friendly choice, since dust from Fair and muddy paw prints brush right off! I moved the lacing from the center back to the side backs, just because I wanted to (and because I wasn’t thinking this would double the amount of hand-bound eyelets I was going to have to do! ), which caused some unexpected issues with the fit. Logic would tell you that a pattern will fit you no matter where the opening is, but somehow this is not the case. I ended up having to slash off nearly an inch at each opening to get the fit and support I was looking for. The front is fully boned with heavy-duty cable ties, with a couple in back, as well, for a nice smooth line. I piped the edges of the bodice with bias piping of black wide-wale corduroy, and put in thirty hand-bound eyelets. The skirt is my normal skirt pattern (the underskirt from the OOP Simplicity Irish dress pattern), cartridge pleated to the bodice, with a flat/unpleated front. That skirt attachment caused me no end of grief (ok, I guess it ended; it is finally attached and I’m not having nightmares about it anymore. Much. ), but finally worked out all right in the end. I knew I wanted to stiffen the hem, and after dithering over my 4″ horsehair braid for several months, I finally changed my mind utterly and went with 2″ cotton belting, which was easy to work with and holds the skirt out beautifully. I sewed it on like a hem facing, flipped it to the inside, and catch-stitched (caught stitch?) it down in strategic places so it wouldn’t flip out or cause the gores to pucker. Alas, I seem to have made them too big, so they’ll need a little bariatric surgery for next year. An upscale hairstyle for those Florentine days. I bought the beaded caul on etsy. With the Lionheart Biretta and some chunky, Cranach-style gold necklaces, the kirtle goes German for a day!